Hey there! I know I neglect the boy department a lot on this blog. Sorry about that - but a friend of mine just had a little boy, and I decided to make this little valentine onesie for him (L this is for little A :). Perhaps I can make a few more things for him and increase the number of "boy-themed" projects. 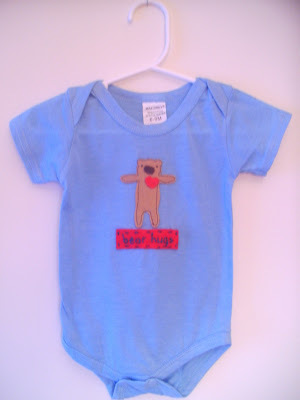 This onesie was inspired by one at Janie and Jack - but it's pretty different so I didn't feel a need to share that pic. If you want to see theirs click here. Step 1: Print the pattern and cut out the bear, bear nose, and heart. Step 2: Thread a needle with brown embroidery floss. Hand stitch the eyes (just make little knots) and the nose onto the bear. Switch to red embroidery floss and hand stitch the heart onto the bear. Step 3: Pin the bear to the onesie. Topstitch around the edge of the bear - using brown thread. Step 4: Cut a small rectangle out of the red felt. Write "bear hugs" on it using the water soluble pen. Embroider over your letters. Step 5: Pin the rectangle to the onesie under the bear. 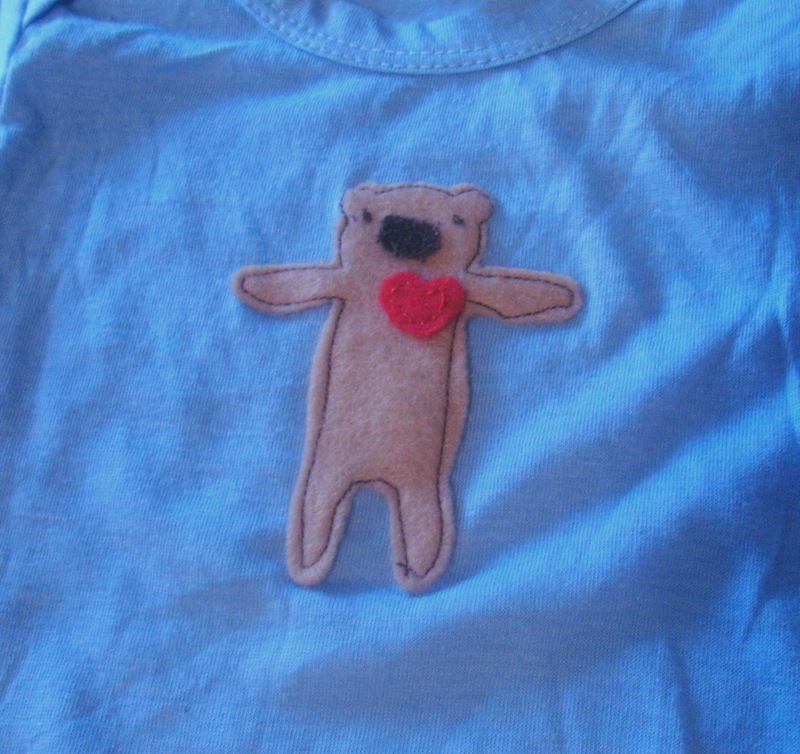 Hand stitch it on - using the same floss that you used for the "bear hugs" text. That's it! Give your little man a big bear hug! congratulations! You have 5 days to contact me (use the "contact me" form on the right sidebar) and send me your information. Hope everyone had a great weekend!